Divers who entered the wreck of a tour boat that sank in a storm off the southern Thai resort island of Phuket described heartbreaking scenes of bodies of children found in the arms of their mothers, as the search continued Saturday for 15 mostly Chinese tourists missing in a disaster that has left dozens dead. The death toll from Thursday’s tragedy climbed to 41, in Thailand’s biggest tourist-related disaster in years. It was not clear how many of the dead and missing were Chinese. In announcing a previous death toll of 33, authorities said all of those victims were Chinese. “It’s very difficult to see … it’s traumatic, it’s tragic but the best thing to do, our job as divers, is to bring back the bodies to their families,” diver Philip Entremont told reporters before resuming the search Saturday. The boat, with 105 people, including 93 tourists, capsized and sank after it was hit by 5-meter (16-foot) waves. The death toll jumped Friday after the navy sent divers to the wreck. In images shortly after the sinking, rescued people sat in large rubber life rafts surrounded by churning seas. Phuket Gov. Norraphat Plodthong announced at a news conference on Saturday evening that the death toll had climbed to 41, with 15 missing. Prime Minister Prayuth Chan-ocha, the leader of Thailand’s military government, expressed his “sympathies and deepest condolences” to the families of the dead. The government will “exert all efforts to find those still missing and provide support to all survivors of this tragic event,” he said in a statement. Chinese President Xi Jinping called for all-out search and rescue efforts, telling the Ministry of Foreign Affairs and Chinese diplomats in Thailand to take greater measures, and also urging Thai authorities to spare no efforts. Lyu said it hoped the cause of the capsizing would be quickly ascertained and asked Somkid to have the relevant Thai agencies closely cooperate with China on the matter. Fatal accidents among foreign tourists at Thai beaches are not unusual, but normally involve drownings in unsafe swimming areas or accidents involving smaller boats. Thai officials were rushing to cope with some of the logistics of the aftermath of the sinking. At the request of Phuket’s governor, the Phuket Tourist Association was seeking 80 volunteer Chinese language translators to assist the outgoing Chinese passengers at the provincial airport. Many of the victims had been on group tours, booked in Phuket and China. The government of the eastern Chinese city of Haining in Zhejiang province said on its official microblog account that it received a distress alert sent by phone text message from the head of the Haining Haipai Furniture Co. Ltd., from Thailand Friday morning. It said that 37 of the furniture company’s employees and family members had traveled together to Phuket and that on July 5 at around 5 p.m. they encountered the “biggest storm in five years” and they sought the government’s help. The group had booked their tours to the islands online on their own, said the posting. A Chinese tour operator based in the central province of Hunan said on its official Sina Weibo account that three travelers it had booked were missing. 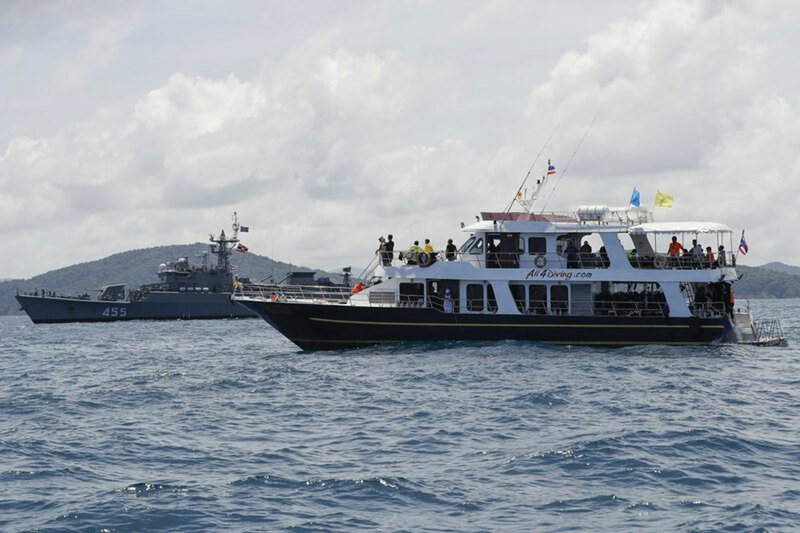 Lazy Cat Travel said it had sent personnel to Phuket to help out its clients, who also included 35 passengers who had to be rescued from another boat that it had chartered that ran into trouble on Thursday. It said that second boat had lost power after being swamped by waves. All on board were returned safely to shore. The accidents came as rescuers, also led by Thai navy divers, support 12 boys and their soccer coach stranded nearly two weeks inside a flooded cave in the country’s far north, and try to determine how and when to extract them.